Our car park is located around 800 metres from the hotel and has a cost per day. This includes the transfer on arrival day and departure day from the car park to the hotel and vice versa. From CARRODANO-LEVANTO: (A12 motorway exit): follow signs for Levanto and then for Monterosso al Mare. At the top of the hill you will go through a short tunnel. 400 metres after this tunnel, on the straight road, you will see a slip road to the left with a sign for La Spezia, Pignone, Vernazza. DO NOT make this turn, instead continue straight. Just beyond this point you will reach a fork in the road and you will see Hotel-Restaurant Monterosso Alto on your right. From here, follow the road down the hill on the right towards MONTEROSSO-FEGINA. DO NOT follow signs to the old town ("centro storico"). The road heads down towards the sea for 5 km. At the end of the road you will see a large sea-front car park ahead of you. This is the public pay car park. Stop in the small square in front of the large car park. On the left you will see Ristorante Miky. From your car you can call +39.0187.817477 / 817550 and mention the make and colour of your car. Information on how to reach the public car park in Monterosso (old town), around 300 metres from the hotel. Just beyond this point you will reach a fork in the road and you will see Hotel-Restaurant Monterosso Alto on your right. From here, go left towards Monterosso old town ("centro storico"). The road heads downwards for 5 km. At the end of the road you will see a roundabout and just behind it a two-storey car park with stone walls. You can PARK HERE. From the car park, walk around 250-300 metres along Via Roma. 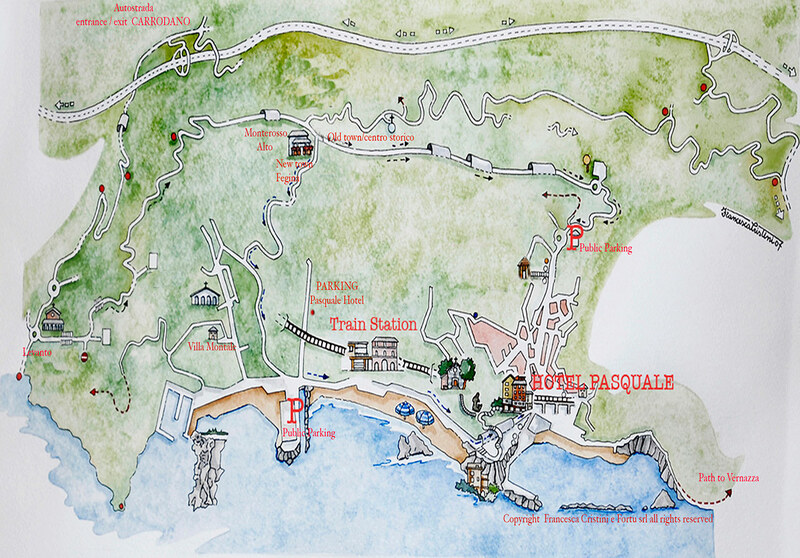 On reaching the sea front, turn right and you will see Hotel Pasquale.